Looking for a romantic location to create the perfect ambience for your wedding day? Want to buck tradition, and skip the usual catering hall affair? If you're seeking the perfect spot to host the most special day of your life, read on for some suggestions for choosing a romantic, yet unconventional wedding reception location in Canada. We especially like them because (a) most of them are not city-specific: they are valid for a wedding just about anywhere in Canada; and (b) most of them will probably be easier on your wedding budget! The site of your first date: If it was a restaurant, why not rent it out for your intimate wedding affair? An ice-skating rink: Give your guests the option of donning skates! A park or public picnic area: Enjoy the ambiance created by lush greenery, and save money on flowers! 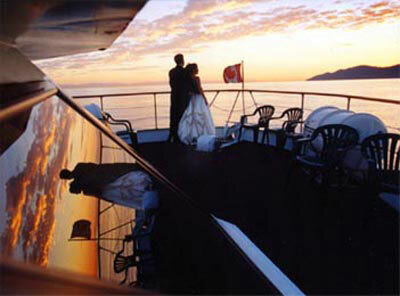 On a yacht: Nothing is more romantic than saying "I do" while sailing the seas. Under a tent: Pitch a tent in your backyard, and create an elegant affair underneath! On the beach at sunset: Let nature provide the perfect romantic backdrop for your wedding day. An old castle: What's more romantic than a gothic setting that transcends guests back in time?